For some time now patio doors have been vulnerable to lift attacks, a method whereby the sliding door is lifted out of it’s track and allowing access to a property. The Ivess Lock solves this problem with a unique locking bolt that is angled into the sliding door to restrict upwards movement. The main lock body of the Anti Lift device is fitted to the frame of the patio door lock, the bolt is then pushed into the door. With a lightly sprung pin this lock is easy to use by anyone. As featured on Dragons Den, the anti lift device has a very simple locking method, the spring loaded bolt is withdrawn by simply pulling the large black knob, when fully retracted the knob can be twisted left or right to hold the pin in the open position. When retracted the Ivess lock pin is an extra 1.5cm further out than normal, this allows for an easy visual check to make sure the patio door is secure. Fitting of this patio door lock is very easy, and made even easier with the fitting template that is included with all packs. Simply remove lock from packaging, the cardboard insert when unfolded is used as a template to fit the lock, the lock is supplied with 2 self drilling holes for easy installation. Multiple Ivess locks can be used for increased security, these extra locks can be fitted to the top and bottom of the sliding door section and even on the side rail. 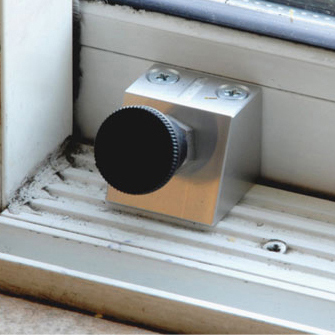 Secure ventilation can also be achieved with the Ivess lock, by the addition of a second hole for the locking pin slightly further along the door sill. With a second hole, the lock can be used to hold the door in a slightly open position, allowing good ventilation but restricting the door to be opened further, this is great protection for pets and children. This patio door lock is not locked with the use of a key, where this function allows for easy use, it could also allow an easy exit point for an intruder who made entry via another door or window. 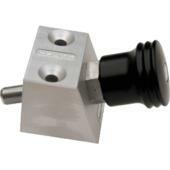 Search Ivess on this site to place and order for this innovative patio door lock.